Honda will be setting thrilling new challenges and encouraging visitors to get involved in some racing of their own at the 2012 Goodwood Festival of Speed. The Honda Racing-themed stand will be a buzz of excitement as visitors race ride-on lawn mowers and navigate a mini British Touring Car Civic around a scale version of the iconic Goodwood Hill Climb against the clock. 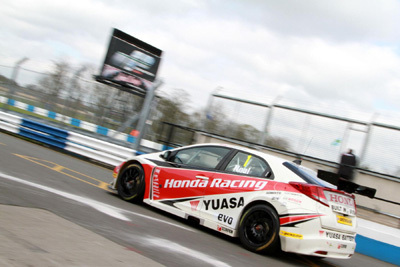 Honda, alongside Racing Bug Motorsport; manufacturers of the world's leading scale motor racing systems, will be creating an exciting new challenge for the Festival to give visitors the chance to take on the famous track for themselves. The new challenge will allow participants to navigate a remote controlled Civic on the Hill Climb by using real steering and pedal controls to pit their skills against Honda BTCC drivers Matt Neal and Gordon 'Flash' Shedden who will have set a time at the beginning of the weekend. Precision timing will measure driver performance to within a hundredth of a second and prizes will be awarded to the fastest drivers to ascend the hill. Honda’s ride-on lawn mowers will be racing at a more leisurely pace on a 20 metre course as guests go head-to-head with friends and family to try and top the leader board and be named the ultimate Honda lawn mower racing champion at the end of the weekend. The Honda stand will also feature a specially designed ‘Pit Stop’ chill out area where people are encouraged to stop by, pull up a deck chair, rest their feet and soak up the adrenaline-fuelled atmosphere. All the activities on the Honda Racing stand are completely free of charge. Goodwood Festival of Speed is also providing the ideal backdrop to unveil the new Civic MUGEN Concept. This Concept highlights the magic the MUGEN Euro team can weave and hints at what a production Civic MUGEN could look like. The concept will sit alongside Gordon Shedden’s BTCC racing Civic, the 2012 Samsung Honda Fireblade and James Toseland’s 2007 championship winning Ten Kate Honda Fireblade. Fans of the full-sized Goodwood Hill Climb will see triple British Touring Car Champion Matt Neal take his BTCC new racing Civic up the track everyday. Meanwhile, two-wheel enthusiasts will see Michael Laverty and John Kirkham riding the 2012 Samsung Honda Fireblade, John McGuinness on the Honda TT Legends Fireblade and Jason O’Halloran riding the 2006 HM Plant Fireblade machine. All riders and drivers will be regular visitors to the Honda stand throughout the weekend to take part in the activities and sign autographs. The Goodwood Festival of Speed runs between 28 June and 1 July and tickets can be booked in advance by visiting the website - goodwood.co.uk/festival-of-speed.